Looking to buy or sell both weanling and/or feeder pigs? Red Rock Holdings, Inc. is a resource that provides dependable service to such swine producers, as Red Rock Holdings, Inc. is licensed in many states and bonded as well. Red Rock Swine Management is an additional set of eyes to look after your investment, providing you with weekly production information and written reports of walk-throughs and more. An upcoming new feature will be the Red Rock storage units, available for wintering your camper, motorcycle, RV. Stay tuned for details. Wanting to better your operations or transactions and not sure where to start? Start the conversation with us today! 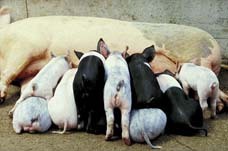 Looking to buy or sell sew or feeder pigs? Check out our listings or submit yours. We provide services that give you optimal networking opportunities, plus staying in the loop for the latest news. Our diverse backgrounds and almost 80 years of experience gives us a unique perspective into your operations for ultimate customer satisfaction. Red Rock Holdings, Inc. is an agricultural company with an emphasis on swine and grain industries. You can expect dependable service and open communication from experts in the swine industry in all transactions. Red Rock Holdings, Inc. has numerous services which are customizeable to individual needs.